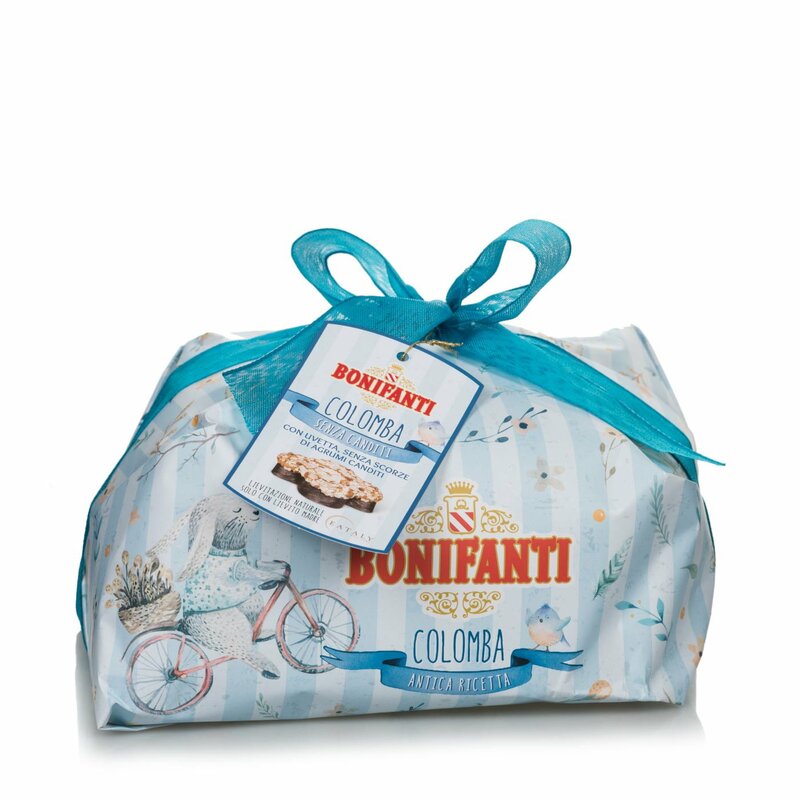 From the experience of Bonifanti, a classic Colomba for those who do not like candied fruit. This traditional Easter treat has a soft dough without candied fruit but with plenty of raisins, covered with a crunchy hazelnut glaze garnished with almonds and sugar granules. 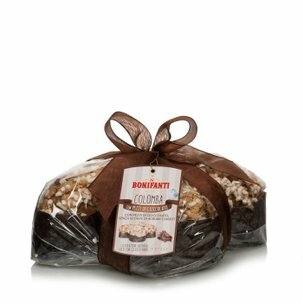 Serve it with meals if you don't want to miss the Colomba and don't like candied fruit. Ingredients Wheat flour, Sultanas 15,1%, Sugar, Water, Butter, Sugar grains 7,2%, Fresh Egg yolk, Natural Yeast Sourdough (contains: Wheat), Almonds 3%, Fresh Egg white, Hazelnuts 1,3%, Emulsifier: mono and di-glycerides of fatty acids, Invert Sugar syrup, Rice flour, Honey, Cacao butter, Milk powder, Salt, Rice starch, Natural Orange Flavour, Vanilla beans from Madagascar. May Contains traces of: Soya. For more information on product labels, please contact our Customer Service department. The information on the labels of the products may vary for reasons beyond our control, therefore, there may be discrepancies between the information on the site and that on the products delivered. Please always check the information on the product before consumption or use. The origins of Bonifanti's production date back to the early 1900s, when the business was primarily a bread bakery. In the '30s Vincenzo Bonifanti decided to focus on the production of a then little known sweet that was destined to become the symbol of holiday festivities in Italy: panettone. The traditional Milanese recipe was skillfully enhanced with prized Piedmont hazelnuts and the strict use of only natural yeast, in order to create an outstanding cake that is in a class of its own. Still today, production operations, which have been transferred from the original family bakery to an ultra-modern plant in Villafranca Piemonte, are conducted in accordance with the original recipe to create a superb quality product that combines the latest production techniques with the honesty of tradition.